The trend away from level 1 to 7 diploma or certificate study at tertiary education providers continued in 2017. This shift away from lower-level study started in 2006 and has been strongest for level 1 to 3 certificates. It reflects the emphasis government has placed on getting more people into higher-level, higher-value qualifications. Tertiary education participation rates in tertiary education for the population aged 16 years to 64 years. See indicator definition. In 2017, 11 percent of the working-age population (16 to 64 years) participated in tertiary education. Half of them were studying a level 1 to 7 diploma or certificate. The other half studied a bachelors or higher qualification. From 2016 to 2017, the rate for level 1 to 7 diplomas/certificates fell slightly. The rate for bachelors or higher qualifications remained stable from 2016 to 2017. Ten years earlier, in 2007, the participation rate for the working-age population was higher, at 16 percent. Ten percent studied a level 1 to 7 diploma or certificate. Participation in bachelors and higher qualifications has remained relatively stable since 2007, at around 6 percent. See Figure 1. Following reviews investigating the quality, relevance and value for money of level 1 to 7 diplomas and certificates in the mid-2000s, the government has placed greater emphasis on getting more people into higher-level, higher-value qualifications. This led to the significant decrease seen in lower-level enrolments since 2006. 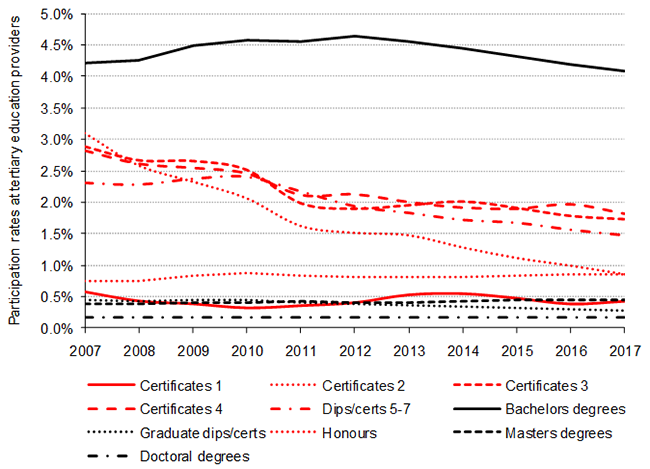 In 2017, participation rates for the working-age population were highest for bachelors degrees (4.1 percent), followed by level 4 certificates (1.8 percent), level 3 certificates (1.7 percent), level 5 to 7 diplomas/certificates (1.5 percent), and postgraduate qualifications (1.5 percent). The participation rate for level 1 to 3 certificates was 3.0 percent overall. See Figure 2. Among the ethnic groups, differences in the participation rates have narrowed for the working-age population to some extent over the last 10 years. See Figure 3. From 2016 to 2017, the rates for the main ethnic groups fell slightly for level 1 to 7 diplomas/certificates. For bachelors or higher qualifications the rates remained stable. 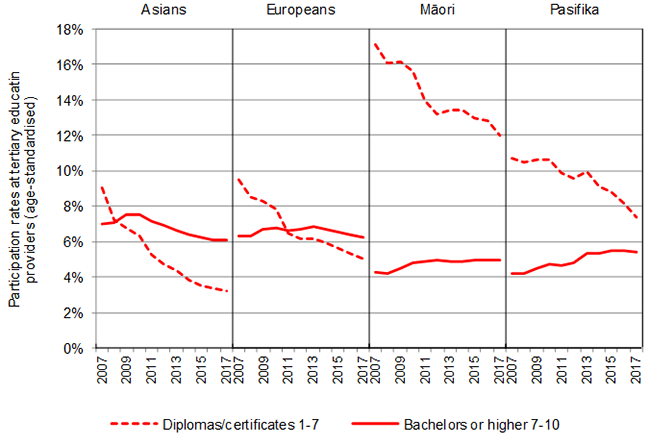 For Māori, the participation rate in bachelors or higher qualifications increased from 2007 to 2017 by 0.6 of a percentage point to 4.9 percent. The increase from 2007 to 2017 for Pacific peoples was 1.2 percentage points, up to 5.4 percent. The comparable rates in 2017 were 6.3 percent for Europeans and 6.1 percent for Asians. Working-age Māori and Pacific peoples have the highest participation rate at level 1 to 7. Nevertheless, their rates at these levels are falling steadily. In 2017, 12 percent of Māori studied at level 1 to 7, and overall their rate was 16 percent. Participation in level 1 to 7 by Pacific peoples was 7.4 percent in 2017. Overall, the rate for Pacific peoples was 12 percent. In 2017, 5.0 percent of Europeans and 3.2 percent for Asians studied at level 1 to 7. The overall participation rate for working-age Europeans was 11 percent and 9.1 percent for Asians. In the case of ethnicity and gender, the tertiary education participation rates have been adjusted using the 2017 national age and gender distribution estimates to produce age-standardised participation rates. Age-standardised participation rates eliminate the effect of the different age distributions of the ethnic groups. This means that the overall rates for each ethnic group are based on the same age structure, that is, the age structure of the total New Zealand population. This means that if a group has a very high percentage of young people, this is not a distorting factor when we compare them with other groups. These overall rates, which are based on the same age distribution, can then be compared with each other without the presence of confounding by age. This is important because study rates tend to be higher for younger people than older people. 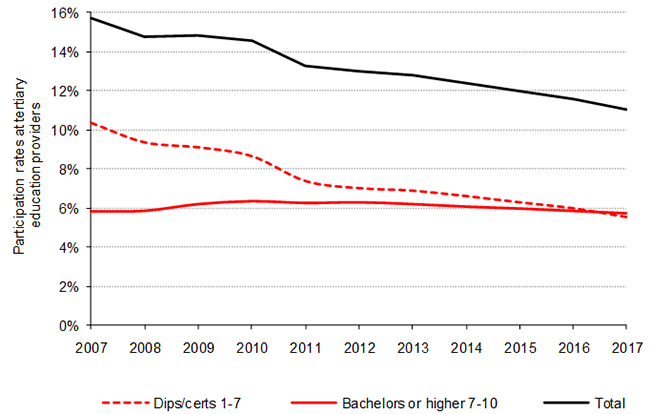 Reflecting the economic recession and higher unemployment, the participation rate in bachelors or higher qualifications increased from 2009 to 2013 for Europeans. It has now returned to the level it was in 2007, at 6.3 percent. Participation in higher-level study peaked for Asians in 2009 and 2010, at 7.5 percent, and it has declined slowly since then to 6.1 percent in 2017. See Figure 4. Factors such as revisions to the population numbers and, in recent years, higher levels of net migration have caused changes in the participation rates. 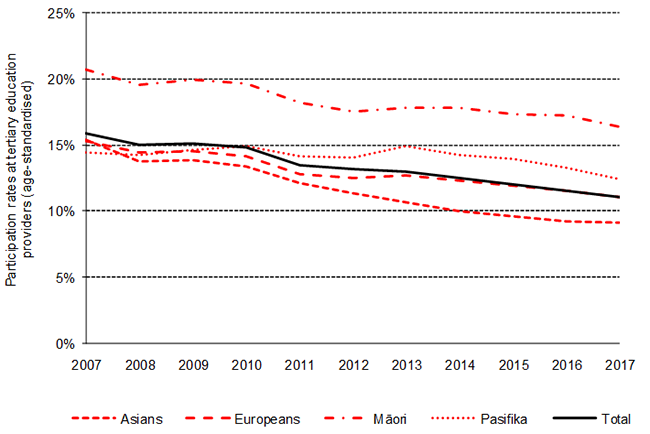 The decreases in the participation rates for the Asian ethnic group are partly due to increases in the Asian population in New Zealand, mostly as a result of increases in migration in recent years. Women in the working-age population participate in tertiary education at a higher rate than men. In 2017, 13 percent of women and 9.0 percent of men were in tertiary study. Ten years earlier, in 2007, the rates were higher, at 17 percent of women, and 15 percent of men. At higher qualification levels, the participation rate of working-age women was just over 7 percent in 2017 and 2007. In 2012, participation by women at higher levels increased to 7.8 percent. This was at a time when the unemployment rate was close to 7 percent. The comparable increase for working-age men was smaller. It was 4.8 percent in 2007 and 5.1 percent in 2012. 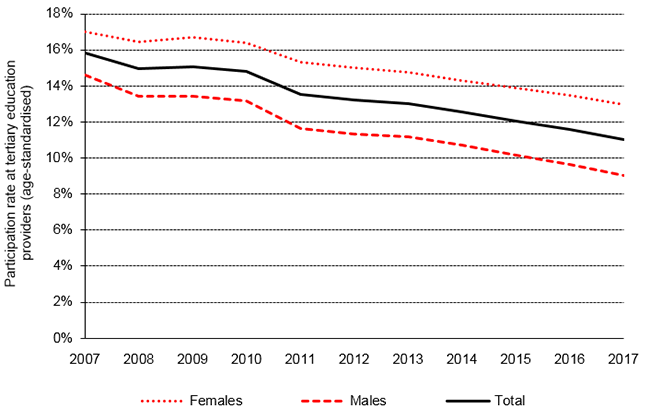 Since 2012, the rate for men has decreased to 4.4 percent in 2017. Working-age men and women had a similar pattern of participation over the last 10 years in level 1 to 7 diploma or certificate study. For women, the rate was 11 percent in 2007 and 6.2 percent in 2017. For men, the rate was 10 percent in 2007 and 4.9 percent in 2017.